However, Southwest may be finally turning a corner as it recognizes the benefits of integrating AirTran with the Southwest network. I've highlighted the risks of merger integrations going awry on various occasions, and investors should keep in mind the possibility that Southwest will hit a snag when it eventually moves to a new reservation and IT system. After all, United Continental seemed to be in good shape until problems with IT integration led to major headaches for customers last year. Southwest's slow pace of integration will probably minimize such problems, while the benefits of integration will lead to bigger profits in a year or two. The first big opportunity for Southwest is optimizing its route network. This month, Southwest finished fully connecting the Southwest and AirTran networks with a "codeshare" arrangement that allows customers to connect between Southwest flights and AirTran flights. It also allows customers to book AirTran-only flights through Southwest. This initiative has shown immediate results. Since the two networks were fully connected, Southwest has averaged more than $3 million of bookings per day on connecting itineraries. The Southwest website has also become the largest booking channel for AirTran flights. Southwest is planning to switch AirTran's Atlanta hub operation to a point-to-point system beginning in November. Currently, AirTran flights are concentrated in the early morning and the evening in order to maximize the number of available connections. However, this setup increases costs compared to spreading flights more evenly across the day, and it is also less convenient for local passengers traveling to or from Atlanta. Southwest's management expects that its new schedule will help it gain market share in Atlanta from top competitor Delta Air Lines , which has its largest hub there. Higher local market share in a major market like Atlanta should provide a noticeable boost to Southwest's unit revenue. Southwest also introduced a new policy for "no-shows" this week. Unlike virtually all of its competitors, Southwest has maintained a very generous policy by giving customers who don't show up for their flights credits for the amount of their tickets (good for one year). Essentially, Southwest has not penalized "no-shows", allowing customers to book multiple flights and only show up for the one that ends up being most convenient. Like other airlines, Southwest regularly "overbooks" its flights to offset the impact of no-shows: i.e. it sells more tickets than there are seats on the plane. However, Southwest's lax policy for no-shows has made it difficult to predict how many people will show up for a given flight. As a result, in 2012 Southwest and AirTran were worse than every other major airline except United in terms of denied boardings due to overbooking. Under the new policy -- which goes into effect in September -- customers need to cancel their flights in advance in order to receive fare credits. This will give Southwest more advance warning when customers change their plans, which should help the company sell more seats without having to "bump" passengers as frequently. 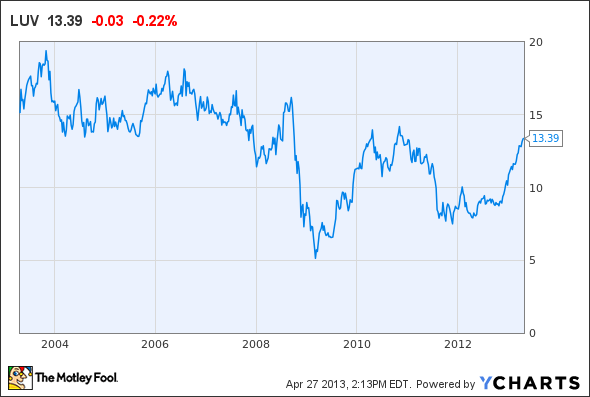 While Southwest Airlines shareholders have experienced a "lost decade", the company is positioned well for the future. The AirTran merger is expected to generate $400 million of synergies this year, which could grow even further in the future as Southwest continues to optimize the combined route network. Moreover, Southwest has only scratched the surface of its potential opportunities, as it has been a purely domestic airline in the past but is now ready to explore international expansion. These factors combine to make a strong investment case for Southwest going forward. The article Profits Lie Ahead for Southwest Airlines originally appeared on Fool.com. Motley Fool contributor Adam Levine-Weinberg is short shares of United Continental Holdings and is long Sep 2013 $33 Puts on United Continental Holdings. The Motley Fool recommends Southwest Airlines. Try any of our Foolish newsletter services free for 30 days. We Fools may not all hold the same opinions, but we all believe that considering a diverse range of insights makes us better investors. The Motley Fool has a disclosure policy.